A recent visit to the Rubin Museum of Art in New York brought to mind the wonderful blog post about Mudras that Indira Govindan had written for us last year. I decided that I definitely wanted to re-read it, and that maybe some of you would enjoy reading it again (or for the first time) too. If you did yoga, you may have used a few in your practice. If you were a Buddhist, you may have seen them on the icons. If you ever sat on a slow crawling traffic, you may have been tempted to create a few of your own. 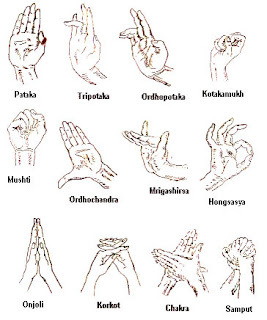 They are hand gestures or _hasta mudras_ as they are called in Sanskrit. Of course, there are hand gestures and _hand gestures_. Gestures have culturally specific meanings and in Asian cultures the word mudra raises the meaning of the hand gesture to a spiritual and artistic plane. 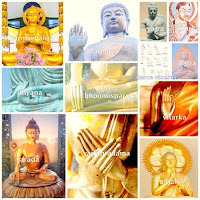 In the image worshipping Asian faiths, the deities are portrayed in their multifarious aspects with the use of _mudras_. 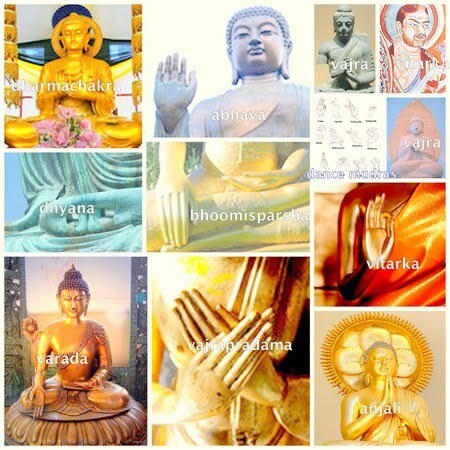 In the photo collage above, there are eight basic mudras. The two mudras that are common in both Hindu and Buddhist iconography are the _abhaya_ and the _varada_. The abhaya is the gesture of “fear not” and is indicated by the right hand raised to shoulder height, the palm of the hand facing outward, the fingers upright and joined. The varada is the gesture of granting wish and is represented with the left palm facing down and outward. Symbolically, the two gestures speak to the salvific aspect at the core of these two faiths of “surrender to me” and “I will protect you”. Along with abhaya/varada, two mudras that are specifically associated with Gautama Buddha are the _dharmachakra_ (turning of the wheel of law) and the _bhumisparsha_ (touching the earth). The dharmachakra mudra symbolizes the preaching of the first sermon in the Deer Park in Sarnath after the Enlightenment. 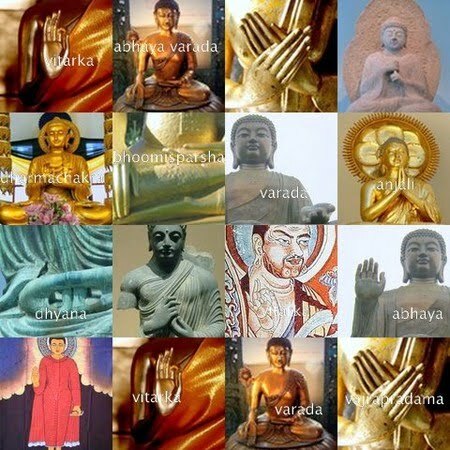 The bhoomisparsha mudra symbolizes Buddha taking the earth as witness to his transformation from Gautama (ordinary human) to Buddha (the Enlightened one). My personal favorite in the collage is the _dhyana_ (meditation) mudra where the back of the right rests on the palm of the left with the tips of the thumbs slightly touching each other with both hands resting in the lap. In the collage, it is stylistically represented with the knuckles touching. Another one worth noting is _vitarka_, gesture of discussion or argument where the index finger and the thumb touch each other in a circle and the remaining fingers are held straight and joined together. The palm faces outward in abhaya motion. Contrast this with the modern gesture of argument in which the index finger is held straight while the thumb rests on the other three fingers. The collage has a couple of variations of vitarka and vajra (strong, confident). The meanings conveyed by mudras are simultaneously simple and multi-layered. If you are a scholar looking to write a book on mudras, they are a treasure trove. But, for the faithful, the mudra’s appeal is transcendent. For me, as a practicing Hindu, the appeal of abhaya/varada is direct and immediate. The *yoga mudras* are used for healing purposes. The hand is considered a source of energy (_prana_) with each finger representing one of the five natural elements—the thumb is fire, the index finger air, the middle finger ether, the ring finger earth and the little finger water. An imbalance in any of the elements causes diseases and, can be corrected with the use of mudras. The most familiar one is the gyana mudra, in which the index finger and the thumb are brought together with other fingers held straight. This mudra is used for developing concentration, memory and spirituality. This is the same as vitarka and founders of religious faith such as Buddha are often depicted in this pose. This mudra is also practiced for developing extra-sensory perception. The other familiar ones are the _prana_ and _shunya_. If you want to read more about healing mudras, there are two popular books: Healing Mudras by Sabrina Mesko http://www.amazon.com/exec/obidos/asin/0345437586/1000markmindb-20 and Getrud Hirschi:Yoga in your hands http://www.amazon.com/exec/obidos/asin/1578631394/1000markmindb-20. Finally, there are the dance mudras used in the classical south Indian dances such as _Bhartanatyam_, _Kathakali_ and _Kuchipudi_. The classical Indian dance places a great importance on _bhava_ (expression) and it is conveyed through _abhinaya_ (gestures). 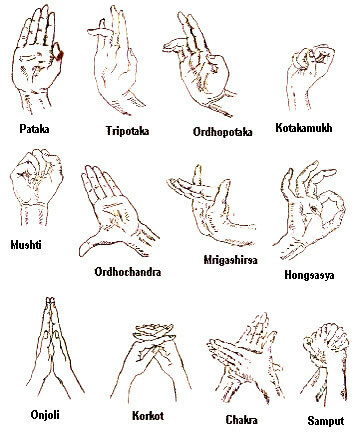 There are a total 52 basic hand mudras and a number of permutations and combinations have been created out of these basic mudras (see photo for a sample of Kathakali mudras). This blog was written by Indira Govindan of www.dharmakarmaarts.1000markets.com. She is a member of the Mind Body Spirit Marketplace. How informative! I didn't see this post last year. Thank you for re-posting it. I agree. I'm so glad you reposted this one. I can not resist sharing my photo, Buddha's Hands. Hope that's okay. Thanks!